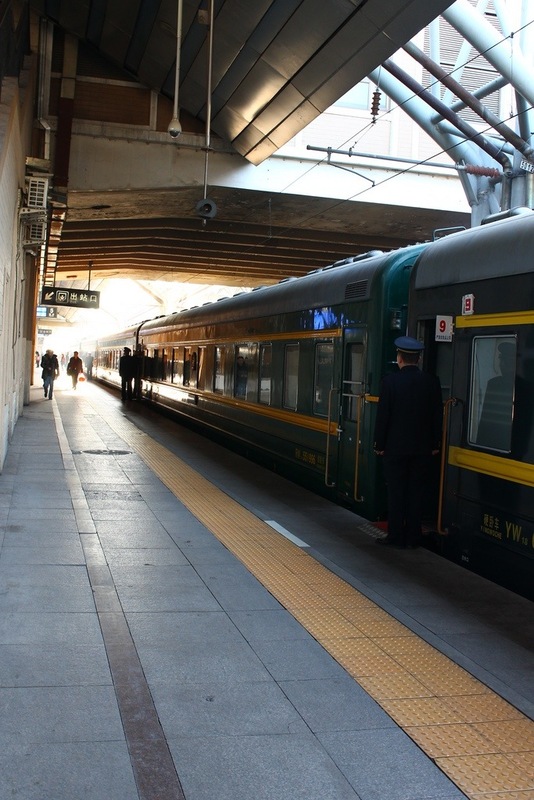 We boarded the train early, on a cold April morning in Beijing. 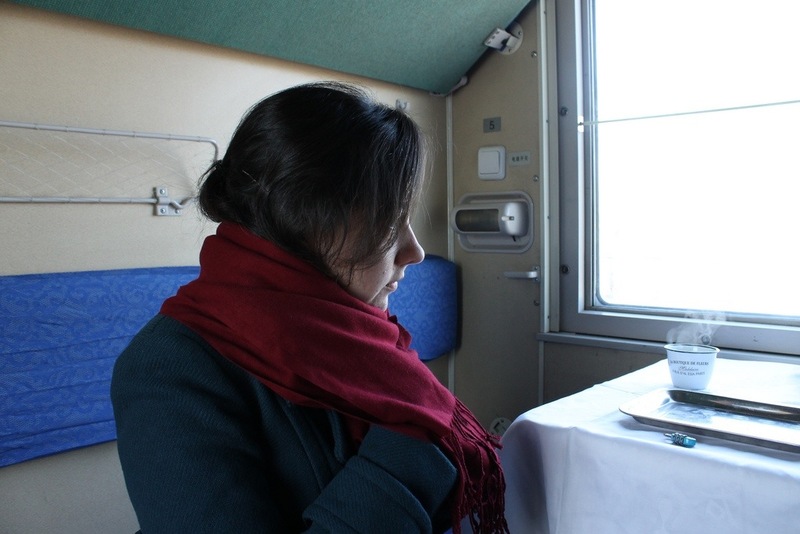 The train wasn’t heated except for a small corner where a samovar (or hot water tank) was slowly bubbling away. 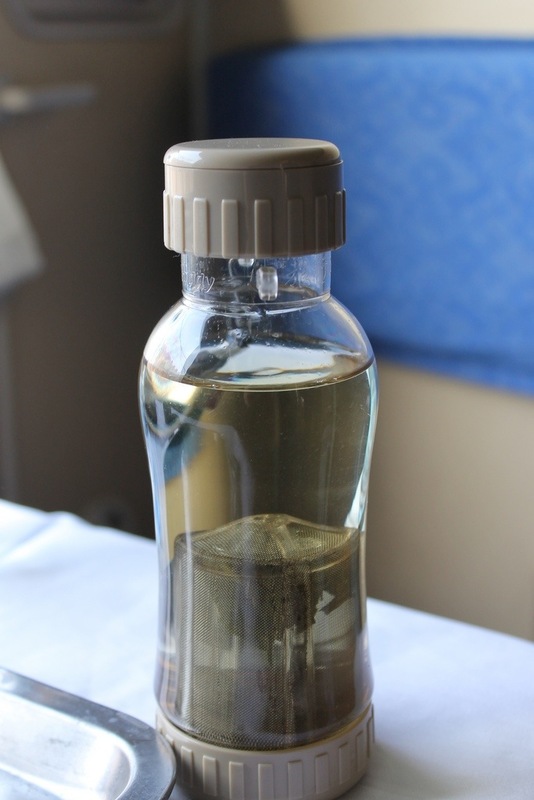 The hot water tea bottle we had picked up in Hangzhou suddenly sprang to mind and we filled it with ‘first flush’ Dragon Well/lóngjǐng tea to celebrate our last day in China. Pulling out of Beijing’s Central Station marked the beginning of our 6000 kilometer journey to Moscow, though we were due to disembark for a brief stay in Mongolia. In the last two weeks, we went from the tropical temperatures of Hong Kong to desert frosts of -20°C! Hence the scarves and hot drinks which doubled up as hand warmers. Before long we were travelling through mountains and past lakes bringing back distant memories of our train journey through the Rockies months earlier. 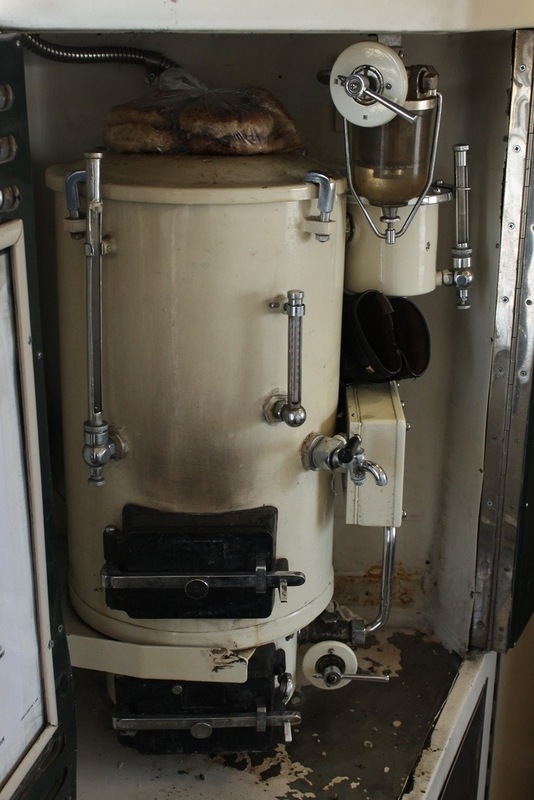 This is the samovar which is a central part to life on the Trans-Siberian route – not only in terms of its being a meeting spot but also as a vital source of heat and drinkable water. Notice the train conductor’s gloves and buns keeping warm against the hot water tank! 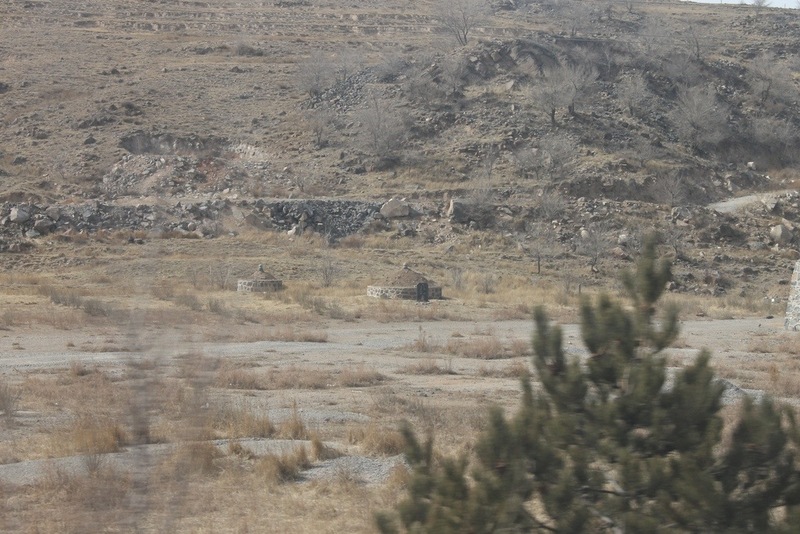 Later that day we passed through more Chinese country side, notably skirting more remains of the Great Wall. 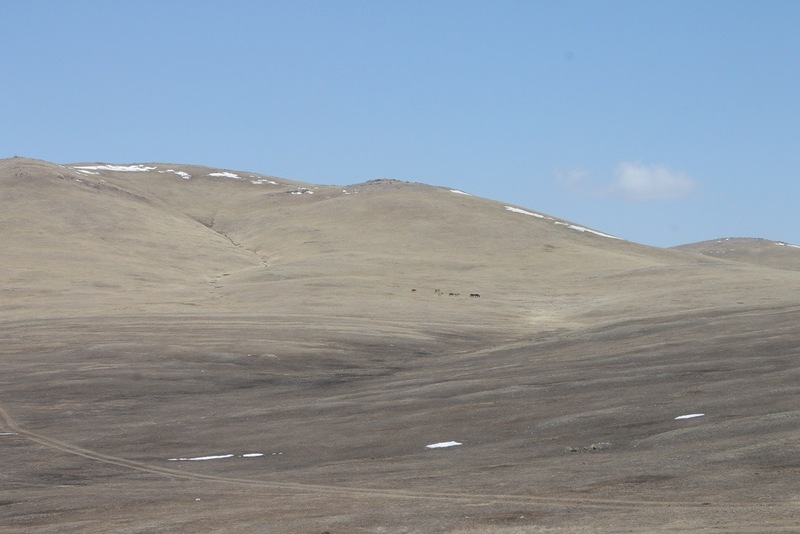 Unlike at Mutianyu this is the ancient wall itself, and its mark across the landscape is unmistakeably striking. Seeing yet more miles of the Wall gave us new appreciation of its sheer scale. 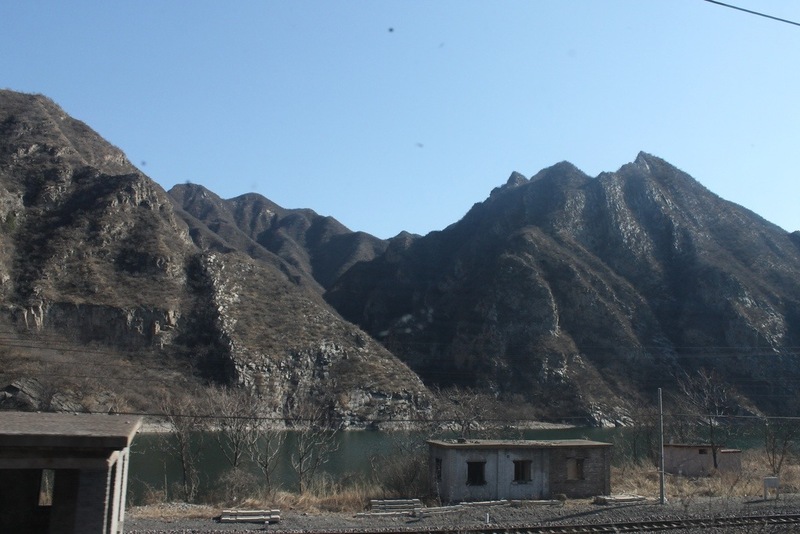 As the train journeyed north, through the less populated plains of northern China we encountered mud villages and solitary stone burial sites. 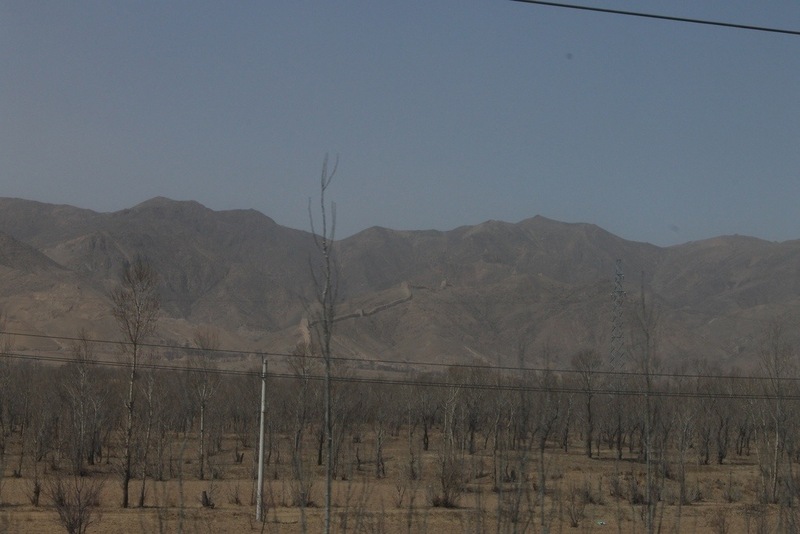 The cold wind sent whirls of dust frenzinging across the land, creating an inhospitable, unruly feel to the terrain (it is claimed that unless something is done the advancing desert will one day swallow up Beijing – something we could believe from watching the endless stretches of beige outside). 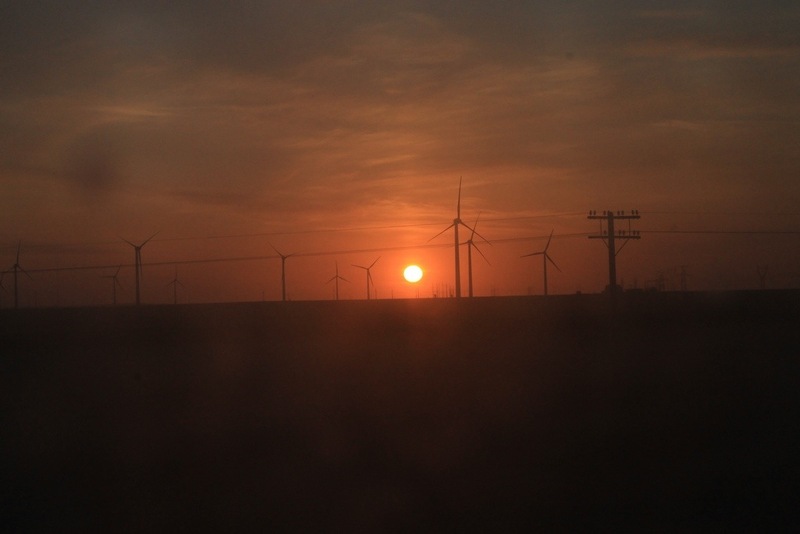 Sunset soon approached and it seemed somehow fitting that our last glimpse of China was of a desert wind farm set, hinting at its bright and greener future. 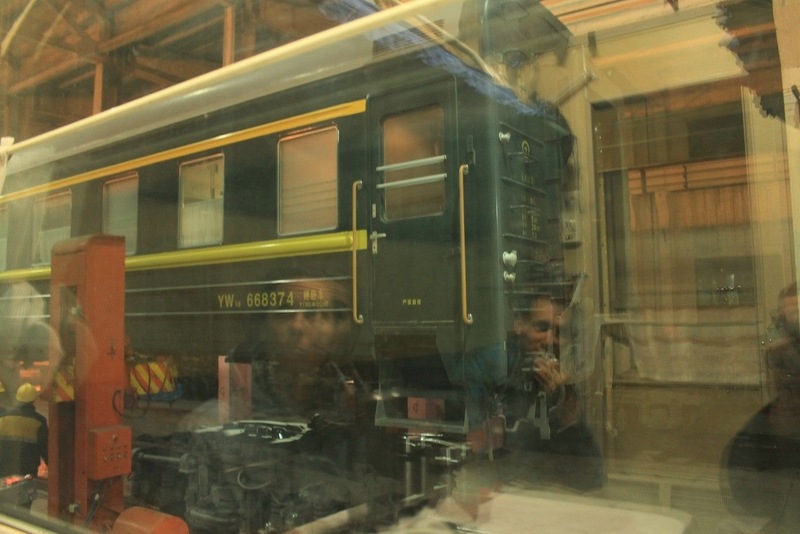 The last station stop in China is at Erlian where the entire train is brought inside a depot and is lifted carriage by carriage off its bogeys (wheels) in order to have new ones put on. 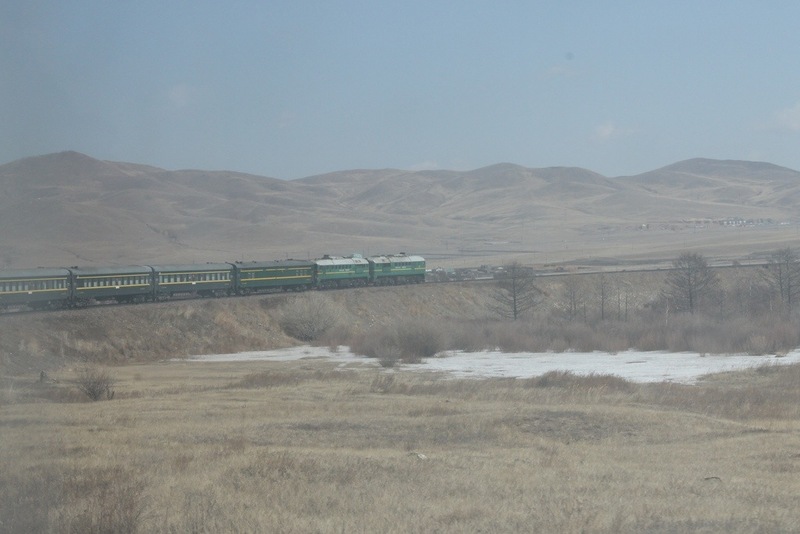 The track is a different width in China compared to the rest of the old Soviet rail network. 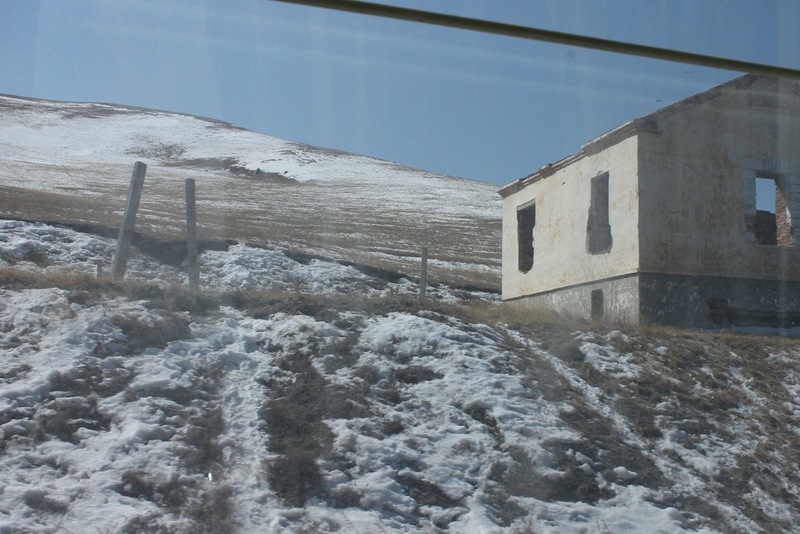 After the wheel change and a brief passport check, we were able to get some sleep – though needed three or four blankets given the freezing temperatures inside the train. The next morning we opened the curtains to the beautiful landscape of the Gobi desert, still tinged by small snow patches and a distant band of wild horses. We got dressed and put on our shoes (it is frowned upon to walk shoeless in the outer corridors) and managed to use the tiny bathroom at the end of our corridor. 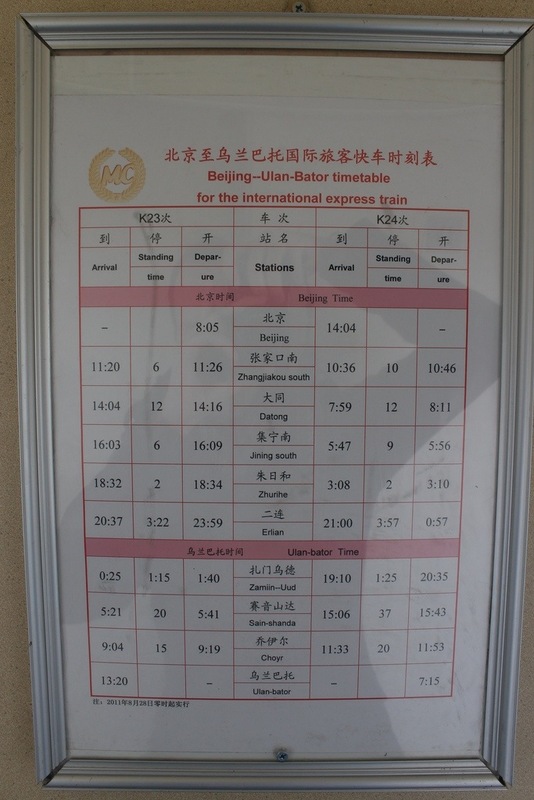 The train’s schedule, all relative to Beijing time. Note the six hour stop at one in the morning as we crossed the border earlier! 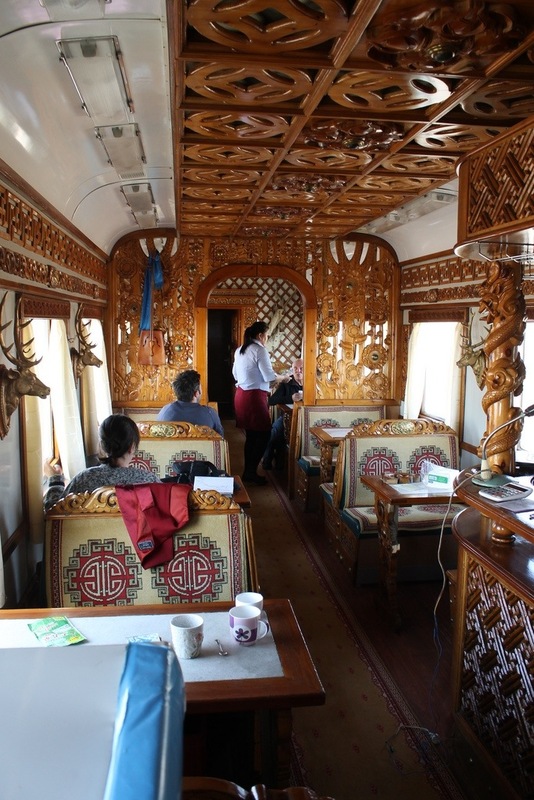 Conscious of the fact we would later be journeying to a camp outside of Ulan Baator, we decided to splash out on breakfast in the beautifully ornate Mongolian dining car. Easily the nicest one we encountered on our entire journey. 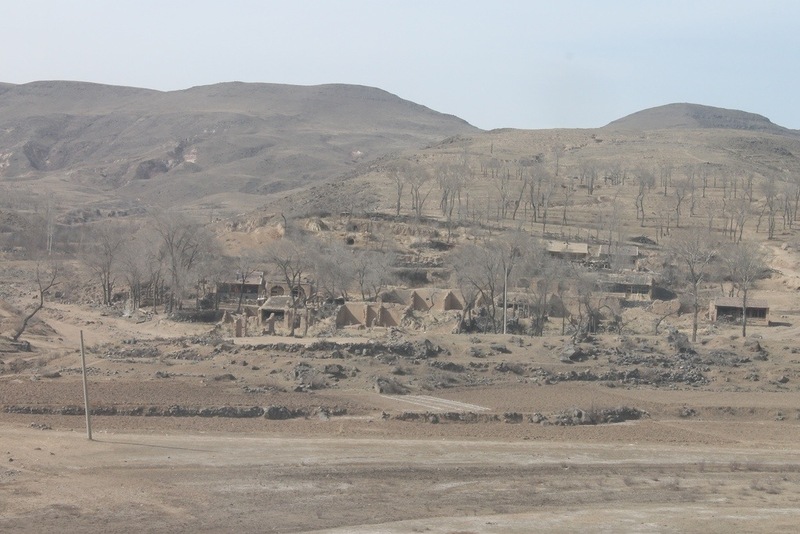 As we travelled further through the desert terrain, we passed various ger camps. There is a power line that follows the train tracks so this ends up being a focal point for various communities scattered along the route, even if they are miles from the nearest station. 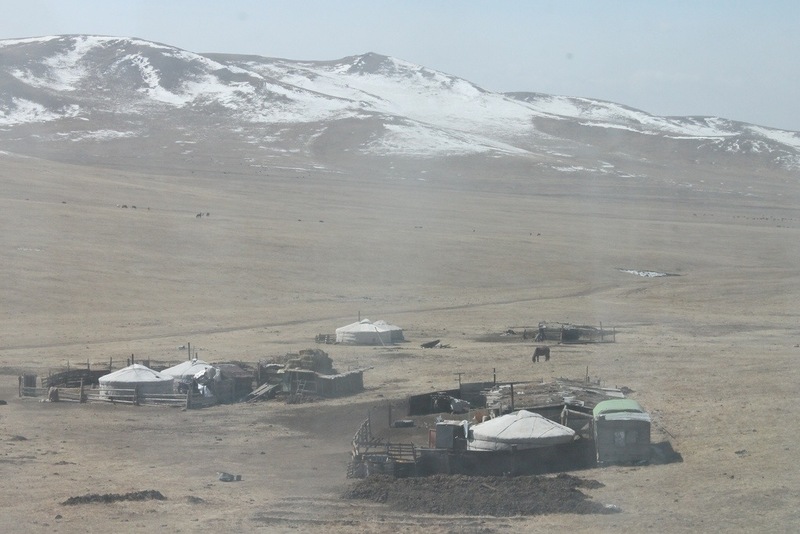 Another small community of nomads… and not another soul for miles around. As the train took a wide bend, we could see its front for the first time. Our first glimpse of snow up close… During the day the outside temperature was close to freezing so we were preparing ourselves for a night in the desert. 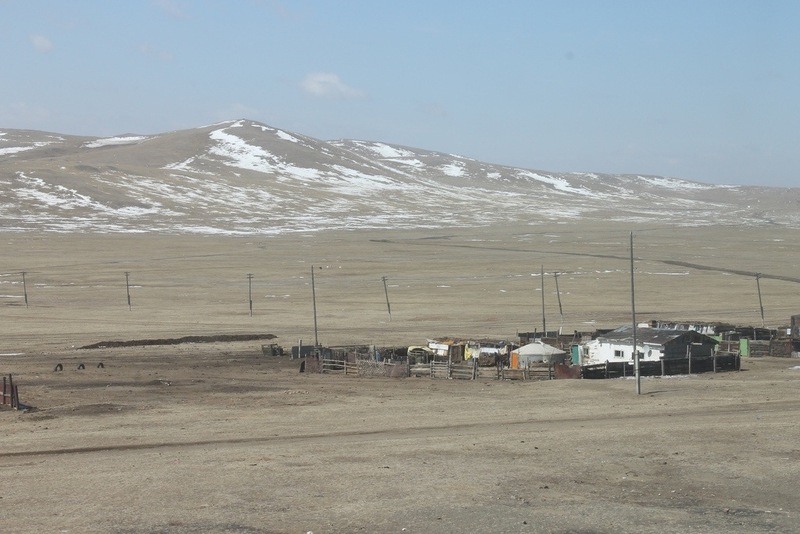 As the number of Ger camps along the track increased, we soon realised these were part of the suburbs of Ulan Batar. It wasn’t long before we saw buildings on the horizon as we pulled into the central station. 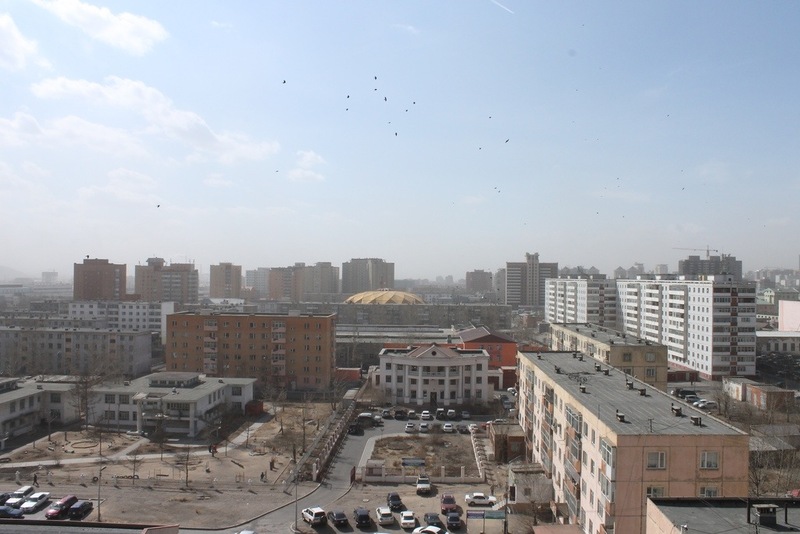 We had arrived in the capital of Mongolia, the city in the desert. 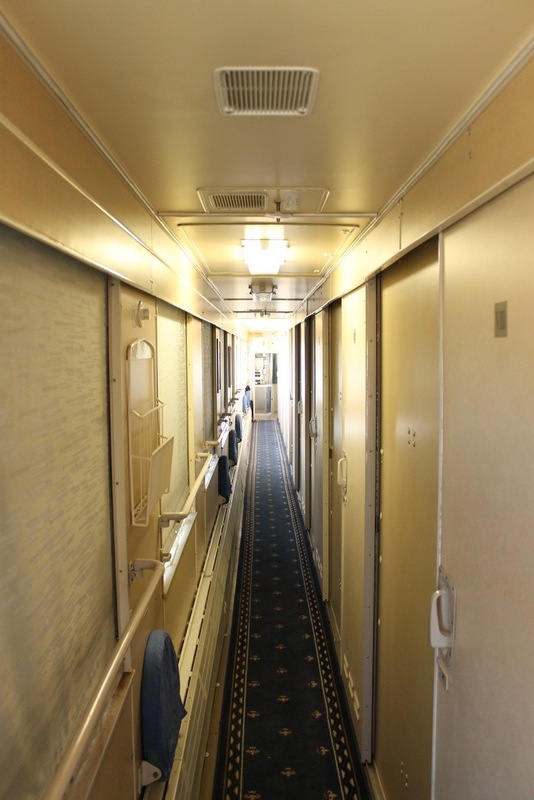 This entry was posted in Travel and tagged Ger Camps, Mongolia, The Russia Experience, Trans-Mongolia, Trans-siberian. Bookmark the permalink.